In this chapter we examine how far the validity of scientific explanation (the style of explanation called deductive-nomological) extends. Can there be any objections to the claim that scientific explanation is the proper mode of explanation for every question? Borgmann discusses such objections to both the necessity and sufficiency of scientific explanation. Borgmann sees the objection to necessity (i.e., the objection which says scientific explanation is not necessary for true explanation) as relatively weak. The argument he offers for this view is that historians give valid explanations of unique events. They don’t try to reduce the cause of WWI to basic scientific principles, but that doesn’t mean answers referring to the Ottoman Empire are somehow invalid. This is true, Borgmann says, but not a good argument, since the core of scientific explanation is subsumption under a lawful pattern. Presumably, if pushed, the historian would also explain the actions of states and individuals with reference to laws of human behavior or politics. Thus this objection is not in principle an objection to scientific explanation, only (at most) to the cogency of trying to reduce complex historical data to physics (a task I agree is fruitless). Three objections to sufficiency (i.e., objections which says scientific explanation is not, in every case, enough to provide true explanation on its own) are given more weight. First, it has already been noted by Carl Hempel (a philosopher of science) that scientific explanation gives an answer to a why-question, but not to a request to explain a concrete thing or event. “Explain the Northern Lights” is simply not a sensible thing to say in the deductive-nomological framework (it is questions like “Why are the northern lights such-and-such a color?” that are countenanced by the framework). So it seems we may have explanatory desires that outstrip the power of scientific explanation. Borgmann calls explanations of these questions deictic: they satisfy our desire to know things themselves in their cosmological/ontological setting, not just why things have certain features or behave in certain ways given their ontological settings (in Chapter 5, Borgmann introduced the term apodeictic to describe this latter kind of explanation). Second, Borgmann points out that any explanandum (any thing to be explained) exists in a nexus of a complex causal network. So “it is clear that when an explanation disregards that aspect of the event that is of concern to me, it fails to satisfy my need to understand” (23). What he is pointing out is that a given event can be subsumed under a great many laws and generate a great many simultaneously-valid explanations. Borgmann gives the example of observing a hawk sitting on a post watching a squirrel. Soon, the hawk leaves. If we ask, “why was the hawk sitting 5 feet from the squirrel?” we can give an answer based on geometry (utilizing the Pythagorean theorem and the height of the post) or based on ecology and the laws of animal behavior (saying, for example, “perhaps the hawk wasn’t hungry”). Scientific explanation itself does not tell us which one of these explanations is useful, suitable, or desirable. Thus there is always a (non-scientific) element of selective judgment in choosing the appropriate kind of explanation. Third, Borgmann points out that science has not been able to successfully explain itself, on three levels. There is no scientific explanation of (a) how scientific laws are discovered, (b) how problems get stated clearly enough to be explained scientifically, and (c) how science makes actual progress in our understanding of the world. Clearly, each of these is a question eminently worthy of explanation, and explanations have been proposed, but none with a deductive-nomological character. Borgmann draws an interesting connection between “progress” in science and the concept of deictic explanation. Progress in modern science is marked by “improvements in the scope, precision, and consistency of [its] laws” (23). The dramatic increase in precision sets modern science apart from its ancient counterparts. Aristotle’s laws, for example, had deductive-nomological character, while at the same time articulating a single, comprehensive vision of the world, encompassing (even) ethics and metaphysics. Borgmann claims that the sharpening of scientific precision causes it to increasingly divest itself of deictic power, choosing “world-explanation” over “world-articulation”. That the deictic power of the sciences has waned is not a failure in general. Deictic disciplines still exist: “Art has always been the supreme deictic discourse” (26), and at times philosophy, religion, or politics. But in our modern society, it is not artists or philosophers who are called on in a crisis. Thus if the character of modern scientific explanation fails to provide the “orientation” needed for real political action, a worrying gap can be seen between apodeictic science and our deictic heritage. Borgmann does not make explicit at this point where technology fits into this picture. I take it, however, that it is of paramount importance, since technology, viewed as the concrete outworking of a tacitly-assumed scientific worldview, is often heralded as a vehicle for human political/social progress. We therefore need an explanation of technology which sheds light on the “gap” mentioned above. In other words, we must not assume that a scientific explanation of technology will be satisfying or even forthcoming. Borgmann wants to propose instead what he calls a “paradigmatic” explanation of technology (wherein technology’s essence is explained by looking at the typical or paradigmatic pattern of technology). 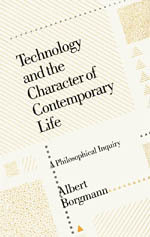 We’ll begin that discussion when we look at Chapter 7, “Science & Technology”. I think that the reality of a mixture of nomological laws is critical here. That when we explain things, we are naturally pulling on many different convergent paths to that that single point (like the hawk). It is quite possible for two explanations to fill the same spot. If you are in an airplane holding a helium ballon and the plane accelerates during takeoff, what happens to the balloon? Are their more than one possible explanation? I do fundamentally believe that to articulate is to explain, no matter the path to the articulation. I’m not sure how critical many of these first chapters are to the role of OSS and the changing nature of work. I think that many of these are largely setting up Borgmann’s position within the book, without a precise focus on technology… yet.